With four rounds of the Allianz League behind us and the promotion/relegation battles heating up. We've chosen the form XV of 2018 so far. STEPHEN Cluxton has controlled Dublin’s rhythm as brilliantly as ever. He pulled off one exceptional save in Omagh from Lee Brennan too, although he also let one in at his near post to Kildare’s Luke Flynn for the League opener in Croke Park. Galway goalkeeper and Inishbofin native, Ruairí Lavelle has yet to concede a goal but the same is also true for Rory Beggan, who may well be the outstanding player of Monaghan’s campaign to date. In Inniskeen, when Kerry pressed, Beggan took huge risks in drifting from his goal across to space on the wing, open to a long, switch kick-pass to relieve pressure. Despite the potential perils, Beggan has four clean sheets and against Tyrone, kicked three frees in Monaghan’s one-point victory. COOPER has been Dublin’s best defender for the past two summers and his spring form thus far makes him a shoe-in in either line of our mid-League All Stars. Galway, meanwhile, have conceded just under 12 points per match and partly, a high-performing full-back line have been responsible. Seán Andy Ó Ceallaigh had a huge game against Tyrone but struggled on Paddy McBrearty in Letterkenny and was black-carded against Kerry. Against Donegal, Kevin Walsh switched Eoghan Kerin on to McBrearty, who performed better on the Kilcar man than any defender so far in 2018 and his form has been the most consistent of the Galway backs. Drew Wylie had big displays for Monaghan against Mayo and Tyrone but Conor Boyle has been excellent across their programme so far. Mayo’s newest defensive prospect, Eoin O’Donoghue, began promisingly in Monaghan but found Paul Mannion too quick and strong in Castlebar last Saturday. PART of Éamonn Fitzmaurice’s eagerness to consolidate his full-back line is surely so he isn’t compelled to bring Paul Murphy back – just as he was against Galway last week. Prior to that, Murphy had been Kerry’s most accomplished ball-carrier and arguably, their best player so far in 2018. Similarly, James McCarthy has yet to produce anything other than an influential performance this year at centre-back and almost had a goal in Castlebar last Sunday when he shimmied inside Lee Keegan, but had his shot was saved by Robbie Hennelly. Ciarán Brady has led Cavan’s defence superbly so far in Division 2 but Karl O’Connell is an automatic choice, both for his ability to make ground with strong running and his strength in the tackle. WHEN Brian Fenton attempted a long sideline kick with the outside of his boot to Cian O’Sulivan 18 minutes into the second half of Dublin’s victory over Donegal in Croke Park, the kick was intercepted by Jamie Brennan, who picked out McBrearty, who made the score 0-14 to 0-11. The incident was remarkable for being the first time anyone could remember Fenton making a mistake this year. The Raheny man’s opening night destruction of Kildare ranks among his finest works. Otherwise, it hasn’t been a vintage year so far for midfielders but Galway’s pairing of Peter Cooke and Paul Conroy have been the most balanced parternship, with Conroy’s physicality putting him a shade ahead. Mattie Donnelly has been about the best of them so far in Tyrone but given the spring they’re having, that’s not saying much. 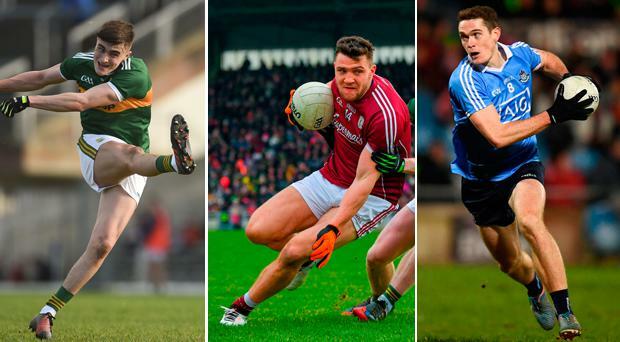 Honorable mentions: Dara McVeety (Cavan), Shane Walsh (Galway), Ciarán Kilkenny (Dublin). BRIAN Howard has made good on his promise and added to Jim Gavin’s summer options at half-forward but presently, Niall Scully is a cert there. He scored 0-2 against Kildare, 0-4 against Donegal and topped a typically involved individual performance in Castlebar with his first Dublin goal. Similarly, Seán O’Shea has been a revelation for Kerry, adding a prolific dimension (0-20, 11f, 1 ’45) to an otherwise merely functional line in the Kingdom’s attack. The pace of Galway’s half-forward line has been another area of strength. Shane Walsh has had brilliant moments but no player has worked as hard or contributed as much as Eamonn Brannigan, with his 2-8 from play from four games. McBrearty and Comer pick themselves. McBrearty has 0-30 (18f) from four games, an average of three points from play per game or 7.5 per game. Comer has been the aggressive, face of Galway’s successful Division 1 campaign so far, scoring 1-2 against Tyrone, 0-2 v Mayo and three points from play against Donegal. Colm Basquel had strong claims after three good opening games, including an important 1-2 off the bench in Omagh. Conor Sweeney has 2-25 (15f) for Tipperary but his attacking partner, Michael Quinlivan gets the nod for his influence and spectacular goals against Roscommon and Cork. Armagh’s Ethan Rafferty (2-18, 0-3f) and Laois’s Gary Walsh (3-27, 0-18f) are also worthy of mention further down the divisions.